Updated 04-12-19. You have a pho recipe and making your own beef pho broth at home is relatively easy. 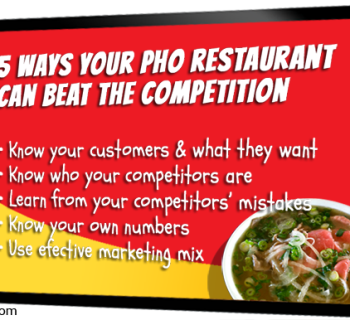 However, there are some easy missteps that can mess you up fast, regardless of how closely you may follow your pho recipe. In this article, I provide a collection of simple yet important things you can do to ensure big success with your next beef pho broth. 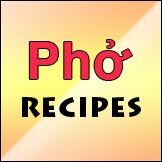 Many of these are included in various different pho recipes, but here they are in one place for quick and easy reference. Looking for a solid beef pho recipe? 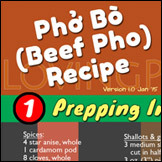 Check out Lovingpho’s own Beef Pho Recipe infographic. Measure about the same volume of water as bones and meat into your pot. Bring water (alone) to boil. Then carefully place the bones and meat in. Bring the water back to boil as fast as you can, and once boiling, parboil for 3-5 minutes to release impurities. Some recipes call for low boiling water with a little longer time. This is fine if you have the time to do it. At the end of parboiling, discard the water and rinse the bones and meat to wash away the scum and other floating solids. Boil a new pot of clean water then put in the bones and meat. Your broth making starts at this point. Note: If you have room on your stove, to save time, it's a good idea to boil water for broth in a second pot. This way, the bones and meat can go right in after rinsing. One reason we eat out is the convenience factor. For the many who want to make their own pho at home, there is no such thing as convenience, and patience and time are the real key. You cannot rush broth making, and you cannot rush the time required to extract flavors from bones and meat. So be sure to give yourself plenty of time, in the range of 3-5 hours, to get as much flavor out as possible. 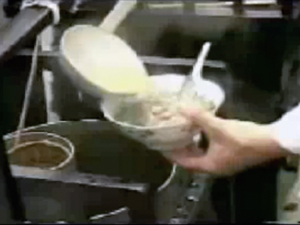 Commercial restaurants may have their own ways to making broth in either shorter time or with much larger quantity, or both. These techniques may not be practical to apply for home cooking, but if you're an aspiring restaurateur wanting to know more, please drop me a note in the Pho Restaurant Consultation page. For the most flavorful and clear broth, your pot needs to be in a constant simmer. Take your time in the first 15 minutes or so to make adjustments to your temperature. This ensures that you have true simmering in the next 3-5 hours; no rolling boiling water, no dead still water either. You want to aim for water having active movement and some rolling is ok, as long as the surface does not break or water is not splashing in the pot, producing big steam above your pot. Once you have stable simmering, you can move on to do something else. Many people miss this part, then have to rush back to adjust the temperature. The damage has been done by then. Regardless of how well the parboiling was done, you'll always have to skim the scum floating while the broth is simmering. Don't skip this step, otherwise your broth will be murky and yucky. There are various skimmers you can use, such as described by Andrea Nguyen's article on Skimming Scum Made Easy. Whatever spices are called for in your recipe (star anise, cardamom, cloves, etc. ), it's best to roast them before putting in the broth. Variations abound, but a quick, easy and effective way is to just roast them in a open sauce pan or in an oven. You want to lightly heat and char but not burn them, so keep watch. Adding heat will release lots flavors and fragrance than using the dried spices straight from the package. Tie them up in cheesecloth before going into the broth for easy extraction later. 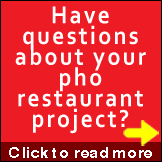 Here are some posts discussing pho spices in more detail: Is It More Than Just Spices That Make Real Pho?, How Long To Cook Pho Spices In Pho Broth, How Best To Add Spices When Making Pho Broth? 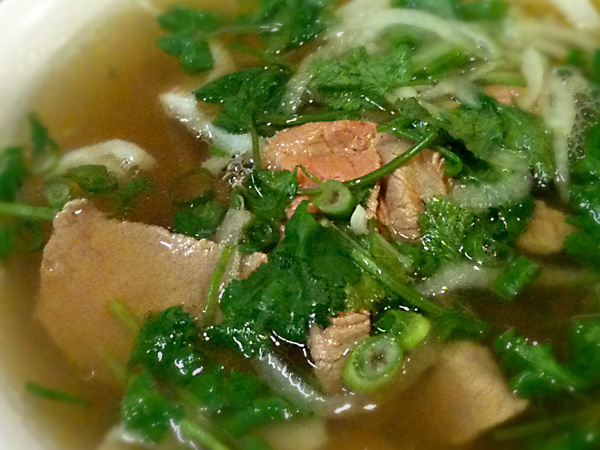 Many beef pho broth recipes call for adding fish sauce toward the final tasting phase. Anyone working with fish sauce knows it's strong stuff and can be easily underestimated (overpour). It can kick up tremendous flavors and add big umami, and you can easily misestimate the amount you put in. So go lightly at first, give a taste, and you can always add more later. Actually, you shouldn't have to use too much fish sauce in your pho broth. When done right, all beef pho broth will have a layer of fat covering the surface. These globules of goodness add great beefy flavors to the broth and retain a lot of the spice flavors that make this a pho broth and not just regular beef stock. Regardless of how "healthy" you want to aim for, do not skim and throw away this layer of fat. You can always stir lightly and exclude the fat as you ladle broth into your bowl as you serve. One other advantage the layer of fat will give you is it protects your broth from interacting with the air, thus preserving your broth quality even as you later store the leftover in your cooler. I hope these little tips and reminders help your next batch of pho broth to be a great one. Do you have other challenges with your pot of pho? Or maybe you have tips to share? Drop a comment below, yeah? In the section leave the fat. I learned something new that with the added layer of fat it protects the broth from the air which means sense. Air increases oxidation and breakdown which for soup we want to keep its flavor as long as possible. But if I owned a restuarant I prefer to remove this layer of fat because achieving consistency is easier when removing this fat. I just freeze cooked soup overnight and ask staff to remove the fat. I watch Madame Vo owner on YouTube and he recommends adding some oil into the final bowl when serving. While I agree adding a bit makes it taste better but according to some yelpers the soup was too oily and they can taste the oil more than the soup. And I’ve seen this happened at a few places where the oil is so much it seems they didn’t even do any skimming or taste like it’s leftover. It seems in terms of achieving consistency its better to have staff remove this as part of the cooking process rather than adding it more oil or leaving in some oil. Pho filet soups are very clear and with no sight or hint of oil and it taste just as good or even better. Also I think less oily broth has the added benefit of appearance and in keeping with the healthy trend. @Vincent: I think you may have mixed up between the fat resulting from cooking the proteins, and the raw cooking oil added just before serving. The two are not the same and are not comparable. The former is totally legit cooking practice, but the latter is questionable at best. Fat layer protecting the food underneath, as discussed in this post, is a well known practice/technique in Viet, Chinese and European cooking. It’s similar to aspic or meat jelly dishes that are served in many cuisines. Examples of Vietnamese aspic include Thịt Đông (Jellied Pork), some Bò Kho (Viet Beef Stew) if lots of tendons are used, and Bún Bò Huế broth where lots of tendons and pig feet are used. Storing these in a cooler will turn them into aspic with layers of fat on top. Each individual dish has its own way of service including heating or not heating before serving. Obviously heating the jelly will turn it back into liquid broth form. We eat Thịt Đông cold, but if for some reason it’s heated then you’d get a fatty pork broth-like solution/soup. For pho, the broth does not have as much gelatin in it so it does not turn gelatinous state but the fat layer on top is pretty much the same concept. One very important note for restaurant pho is that the tendons are never cooked/simmer together in the pho broth. Tendons are always cooked separately in restaurant environment. If we cook tendons together in the broth, then the collagen will come out as gelatin, making the broth murky and turning it into aspic. Regarding adding raw oil to pho: I’m not sure what people are trying to achieve, but I think it’s ill advised. 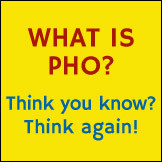 I see people use all kinds of tricks in an attempt to make their pho better/different from someone else’s. But this is one bad practice. In the culinary world and for more well known cuisines, the only times when uncooked oil is used during service are 1) in Western salad dressings and 2) extra virgin olive oil in some Italian dishes, with the condition that a good quality oil is used. 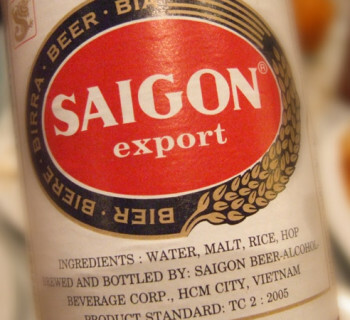 In no other instances of food service, Vietnamese or other food type, is use of uncooked cooking oil appropriate. Adding oil to a bowl of pho just before serving is definitely not recommended, whatever purpose this is intended to achieve. So I agree with you, even though our reasons may be different, that adding oil to pho is not a good practice.